I heard the whispering again last night. Tiny voices, giggling and calling to one another. I can hear them echo down the hallway into my bedroom. When I first heard them I would wake my wife. She would elbow me and tell me to go back to sleep, and so I would. My wife has told me more than once that the voices are a dream. Just silly made-up things that my busy mind creates while I’m sleeping. I have tried to tell her I can hear them when I am awake, but she shushes me every time I bring it up. She is a practical woman. Things are what they are and nothing else. Voices do not whisper at night, and that’s that. In the light of day it is hard to argue with her, and so I let it go. I hardly bring it up anymore. That doesn’t stop me from hearing the voices at night when everyone else is sleeping. I listen silently, and try to go back to sleep. I repeat my wife’s practical explanation to myself; they are a result of my tired imagination. But last night was different. Last night I saw a tiny light pass by through the crack under my bedroom door. It looked just like the light of a lantern. With my wife asleep, and the sun gone, it didn’t seem so farfetched that I might not be dreaming. My first thought was to elbow her, and tell her about the light. But it had already passed by, and she would probably be grouchy and tell me to go back to sleep. So instead, I did what I had never done. I got out of bed, and followed the light. I had to hurry, the light was already at the end of the hallway. It led me into the kitchen, where candles lit a scene I never imagined I would see. My wife’s meticulously cleaned kitchen was covered in flour, dirty bowls and tiny footprints. A cracked egg was on the floor. 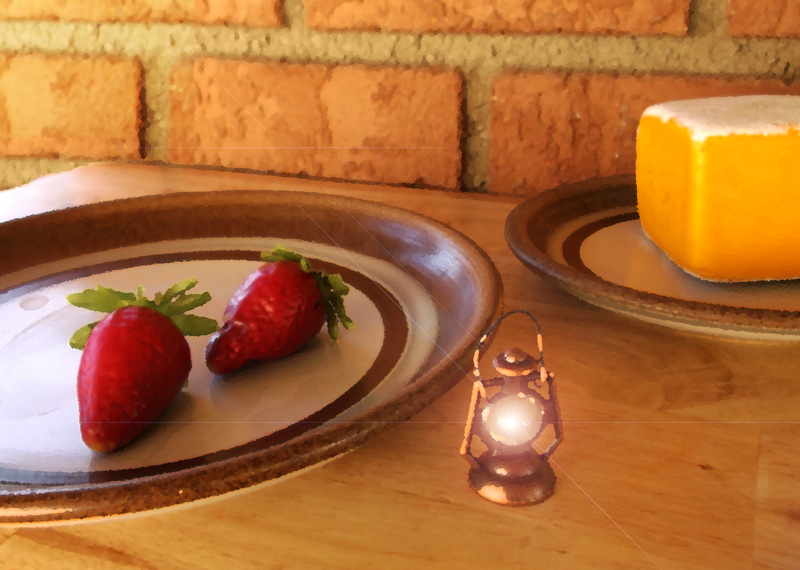 On the center of our table sat a loaf of angel cake with strawberries, next to the cheese wheel that usually sat there. But the mess and the food was not what had me standing in the doorway with my mouth agape. All around the kitchen were tiny human-like creatures, no more than five inches tall. They were all varying shades of green, with tiny pointed ears. All of them stood frozen in place, staring at me. The one with the little lantern stood closest to me, his eyes wide and his hand trembling so hard it shook his curly beard. I felt bad for startling the little people, and searched my mind for something to say that might calm them. One of the taller women (maybe five and a half inches tall) came to the edge of the table and cleared her throat. I looked at her, still unable to form coherent words. “Please do not be alarmed, Giant. We will clean up our mess. We always do.” She folded her hands behind her back, awaiting my response. Her demeanor was very regal. I decided at once she must be in charge. “Always? Do you come here often?” I asked softly, taking care not to startle any of them with my deep voice. I huffed indignantly. My wife had insisted we start putting the dogs out at night several years ago. The graceful woman waved her arm as in invitation for me to sit. It was odd to be invited to sit at my own table. I sat, and watched as one tiny person after another filed into my kitchen. They set up tables and laid out plate after plate of elaborate food for a feast. They laughed and played music. More than a few shied away from my enormous feet, but mostly I went unnoticed. I watched them talk to each other, their tiny voices little more than a whisper, all the while eating the delicious cake that they made for us. When my plate was empty, I left the little gathering and went back to bed. The tiny people waved and said goodbye before starting to clean up their mess. This morning I woke up after my wife as usual. I went into the kitchen, desperately hoping there was still evidence of the night before. My wife stood by the table, hand on her hip, staring down at the empty plate I had left behind. All of the tiny tables, food, and messes were gone as promised. “Good morning, wife. What’s for breakfast?” I could hardly contain my laugh as she frowned down again at the empty plate. Without saying a word, my wife pulled a skillet out of the cupboard and started frying eggs. Who is imagining things now?